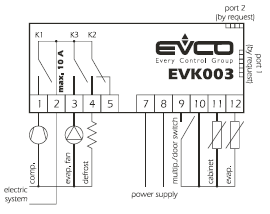 EVK003-digital controller for ventilated refrigeration trucks.The device can be connected to an onboard vehicle power supply system or you can use other mobile power sources; There are two analogue inputs for NTC or PTC probes, as well as three digital outputs. Controllers are available in standard sizes 74 x 32 mm with led display height 13 mm high resolution 3-bit (with the decimal point and multifunctional LEDs) and three control buttons (Setup + on/standby, up and down).Along with the Office of a refrigerating appliance carries a warning about service developments of the refrigeration system and counts hours resource of the compressor.The device can be equipped with a serial port with ModBus communication protocol (for connection to the remote access and management of RICS and key copying EVKEY). In addition, on request it is possible to supply a serial port to connect a remote temperature indicator EVT100. The housing of the device: non-flammable plastic. Size: 75 x 33 mm. Fixing a hole: 71 x 29 mm. Operating temperature range: from -50 up to 150° c for PTCfrom -40 up to 105° c for NTC sensor. Analog inputs: two PTC or NTC (sensor sensor of the evaporator and cooled). Digital input: one (multifunctional or door switch).